Enjoy a unique cruise experience on this 14-day Baffin Bay & Greenland journey aboard luxurious L'Austral. In the remote northern reaches of the planet, you'll see a land abundant with hardy fauna like seals, whales, polar bears, musk oxen, walruses and sea birds. Zodiacs allow you to get up close to the electric blue icebergs, and daily excursions might take you trekking across a glacier or on the search for marine life or wildlife on land. Visit Disko Bay - a UNESCO World Heritage Site - and take in the impressive fjords that tower above the frigid northern waters. You'll even have the opportunity to visit some of the colorful villages where the locals have kept many ancient customs and traditions alive in their daily lives today. Between ice caps and ice floes, past glaciers, icebergs and brash ice, sail to the heart of the northern hemisphere's biggest ice producer. Visit Isabella Bay, a stopover for a large proportion of the threatened Davis Strait-Baffin Bay bowhead whale population. From Greenland's west coast with its mountains softened by glaciers to the Arctic mountain range's steep slopes and Thule's high Arctic tundra, sail through the polar region's most spectacular landscapes. 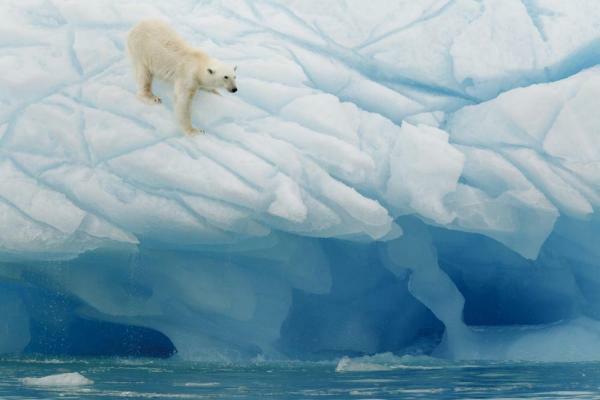 Polar bears, musk ox, and Arctic wolves: journey to see this amazingly rich fauna. 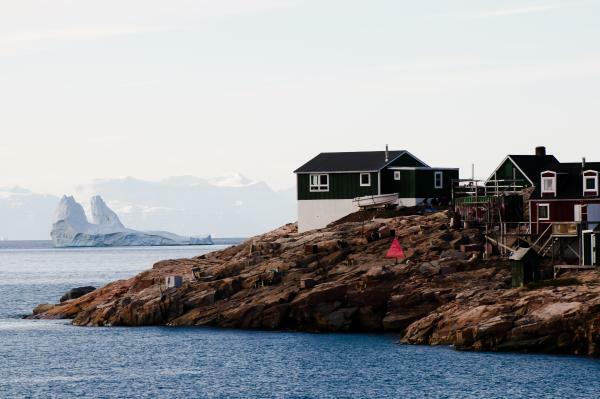 During your cruise, you're invited to discover Sisimiut, founded in 1756 and the second largest town in Greenland. 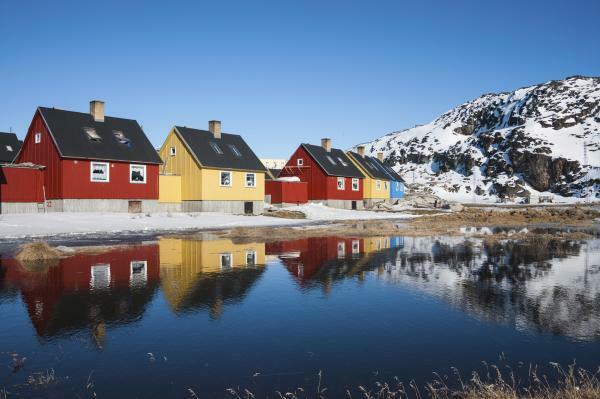 This small town is typical of Greenland, boasting bewitching panoramas: here and there, colorful stilt houses dot the undulating landscape, and the small fishing port stands as the gateway to an icy realm. As for the town center, it is home to a number of historic buildings, a small church and a museum which retraces the history of the Inuit people, as well as many craft shops. When your ship drops anchor here, you will set out to meet the locals in a typically arctic atmosphere. "The most beautiful place in the Arctic" is how Paul-Emile Victor described Greenland. The Eqi Glacier is one of the region’s most impressive sights. Here, the silence is broken only by the roaring and cracking of the ice. It is impossible to know if one is shivering from cold or from the sheer thrill of being here. Imagine the vast outline of a glacier, its translucent crystals glowing with an ice-blue fire in the sunlight. Paul-Emile Victor’s shelter cannot be overlooked - it was from here that the French Polar Expeditions’ anthropological and geographic explorations set off in the 1950s. At the heart of Disko Bay - a UNESCO World Heritage Site - the Ilulissat Icefjord provides an extraordinary spectacle of almost surreal beauty, with the largest icebergs of the northern hemisphere. The sculptural icebergs continue their timeless journey, shimmering with their eternal light. Vast pieces of ice break off from the bergs and rejoin the inexorable movement of the sea. Close by lies the town of Ilulissat, the region’s principal destination. Encircled by icebergs, it has retained a unique mix of traditional Arctic life, with multicoloured wooden houses, huskies and the leather tanners who still work today using the ancient methods of their ancestors. Well beyond the Arctic Circle, in the majestic landscapes of Greenland’s Northwest, you find the village of Kullorsuaq, the last bastion of Greenland’s traditional hunters. 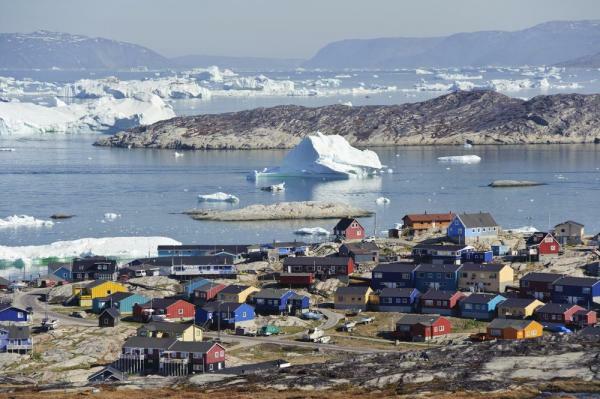 Here is where you can find Greenland’s true character… Vast mineral expanses, sumptuous mountains, impressive glaciers and, above all, the local population which still lives off fishing and seal or bear hunting. Hospitality and respect for nature are essential elements in the daily lives of these men, who live an austere life. When the ship drops anchor in this remote part of the world, set off to discover these friendly people who are also talented craftsmen, deftly sewing the furs and skins of marine mammals. This is a unique and authentic experience. Some places in this world are so magical that their beauty cannot be described in words… Savissivik, a small Inuit village with less than a hundred inhabitants, is one such place. Rightly considered to be the biggest iceberg graveyard in Greenland, it is a stunning sight to behold. During your Zodiac outing, sail between these icy giants that have become stranded in the shallows. Once on land, you can hike to a viewpoint from which to enjoy breathtaking views over these icebergs, which come in an incredibly diverse range of shapes and colors. Photographers love it. Savissivik Bay attracts many bears and is also known for having been the home of one of the world’s biggest meteorites, but the latter has now been moved to a museum in New York. Welcome to Greenland’s northernmost town. With some 600 inhabitants, Qaanaaq, which is also called “New Thule”, perfectly illustrates the quintessence of Inuit culture. Shrouded in darkness during the long winter months, this town, where most people get around by dog sled, was created in the 1950s. The Inuit, who at the time lived some one hundred kilometres further south, were forced to settle here after an American air base was created in their home village. On Baffin Island, located in northern Canada at the mouth of the famous Northwest Passage, there is a small Inuit settlement at the very bounds of infinity. To get there, cross the Arctic Circle, the imaginary line that separates man from lands of mystery and wonder. It’s not so much the way of life that sets Pond Inlet’s inhabitants apart, so much as the setting. Snow-capped mountains, fjords, and glaciers combine in a dazzling natural environment that fills space and expands time. Some discoveries change you forever: this is one of them. All around you is a raw landscape of spectacular beauty. Nothing seems to want to disturb the silence. You are in the Sam Ford Fjord, on the east coast of Baffin Island. Located only a few kilometers away from the Inuit community of Clyde River, this fjord has the kind of world’s end appearance that only the Arctic lands can offer. From your ship, allow yourself to be dazzled by the series of vertiginous cliffs plunging into the waters of the fjord. These impressively high walls of rock, known worldwide to climbing enthusiasts, are reflected in the waters of the fjord, as though to completely shift perspectives and blur the lines between land and sea. Welcome to the kingdom of the cetaceans! Here, those who love the giants of the Arctic won’t know where to look. Isabella Bay is in fact part of the Ninginganiq National Wildlife Area, one of the finest places to observe bowhead whales. From your ship, watch the sumptuous ballet performed by these impressive mammals. With undersea faults over 300 meters deep, Isabella Bay, located on the northeast coast of Baffin Island, attracts cetaceans which come here to feed. 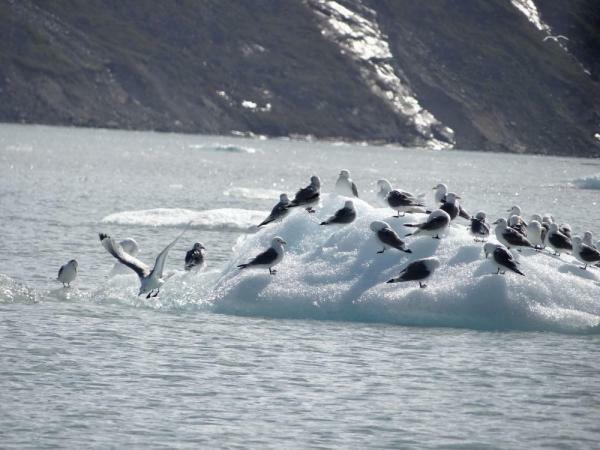 In addition to the bowhead whales, the uncontested stars of these parts, the Ninginganiq Wildlife Area is also home to ringed seals, narwhals, polar bears, king eiders, little auks, and northern fulmars. Located on the east coast of Baffin Island, in Nunavut, Kivitoo is a simultaneously calm and unsettling place that you can explore with your naturalist-guides. This former Inuit camp lying in the heart of a heathland landscape was abandoned in 1923. Here pass before a broken-down cabin surrounded by metal tanks that stored whale oil at the time when cetacean hunting was in full swing. See walrus skulls and the graves of Inuits, revealing their past presence. Kivitoo had its days of technological glory in the 1950s, with the installation of an American radar station on top of the mountain overlooking the area. Located to the north of the Arctic Circle, this town is the starting point of magnificent discoveries surrounded by unspoiled nature. Indeed, just a few dozen kilometers from there it is possible to get close to the Greenland ice sheet, the largest body of ice in the Northern Hemisphere. From Kangerlussuaq, admire also the superb landscapes of tundra in autumnal colors, where Arctic hares, musk oxen, Arctic foxes, reindeer, falcons, and eagles live. Disembark your ship in the early morning. The L'Austral, sister ship to the Le Boreal, is the fruit of Italian expertise and French sophistication. A superb mega-yacht with 132 cabins, the L'Austral links tradition and innovation, cruising to worldwide destinations in luxury. 8 cabins, 226 sq ft, located on Le Champollion Deck. A/C, king or twin beds, seating area and private bath. 28 cabins, 200 sq ft with private balcony. A/C, king or twin beds, seating area, private bath. 200 sq ft with 43 sq ft private balcony. A/C, king or twin beds, seating area, private bath. 3 suites, 290 sq ft with 54 sq ft private balcony, located on the Le France Deck. A/C, king or twin beds, seating area, desk, minibar, private bath. 398 sq ft with 86 sq ft private balcony. A/C, king or twin beds, communicating cabins available. Separate living area, private bath. Fares are based on double occupancy and are capacity controlled. Rates may increase at any time as the ship sells out and subject to change without notice. *Rates are capacity controlled and are subject to change without notice. • Free and unlimited Wi-Fi (Internet access may be slower or in some situations interrupted, depending on certain geographic locations or other circumstances beyond our control). • Dives when authorized by local authorities and feasible with ship equipment and zodiacs. Rates: 70 € per standard dive; 80€ per dive when local equipment or staff must be used, 80€ for a “discover scuba dive” course. In order to participate to diving sessions, guests must have with them a medical certificate less than 1 year old and their up to date dive book. Please do not forget to bring your medical certificates when it is required to participate in an expedition cruise. These voyages include activities such as Zodiac® landings (sometimes wet landings), Zodiac® outings, moderate walks, to more active hikes accompanied by your expedition team of naturalist guides. 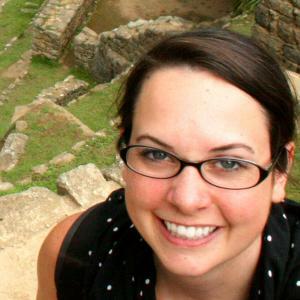 Considering the nature of the programs, a reasonable level of mobility is required to enjoy these expeditions. Initial deposit is 30%, and most travelers will call our office and pay the deposit with a credit card. Alternatively, you can register online here. Final payment is due 100 days prior to departure by Visa, Mastercard, Discover or AmEx. Our guide and driver were very good with their knowledge and were very helpful with our questions. It was a very pleasant visit that would have been impossible to do on our own. Hotels and restaurants were fantastic. The special places we got to go to, like the kitchens, were great. Enjoyed the entire trip! Arctic Cruise: When to Go?